Bed bug bites are one of those things we have heard stories about since childhood, with popular rhymes and verses warning us not to “let the bed bugs bite”. Most people, especially those in the western hemisphere, are familiar with the concept of bug bites that occur when we sleep. Not all bug bites at night are bed bug bites, however, so what are bed bugs and what do their bites look like? What are bed bug bite signs and symptoms and how can we prevent them? Bed bugs are known by a variety of names. They are called mahogany flats, wall lice, animated blood drops, red coats, cimex lectularius, chinches and more, but what exactly are these creatures? 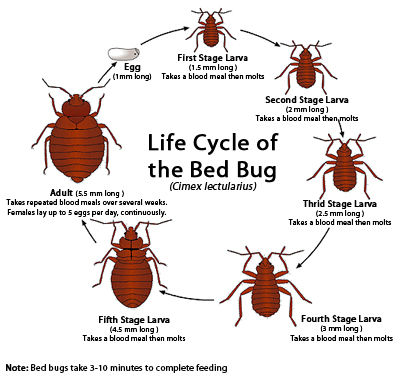 Bed bugs are bugs that live off blood and live both in clean and unclean surroundings, particularly in bedrooms. They choose this habitat because they need fresh blood to live. They can live happily in bedding, clothing and other personal effects of people since they are attracted to carbon dioxide and warmth. Bed bugs are not easy to see, as they are masters of hiding and can fit into almost any nook or cranny. How do they do it? How big are bed bugs? What do we know about them? Breeding Information Bed bugs breed fast. Females can lay 5-7 eggs every single week, and since they can live for quite a long time, a single female bed bug can lay as many as 500 eggs in her lifetime. Bed bugs breed via traumatic insemination in which the male bed bug stabs the female and injects his sperm to her body. In some instances, a female bed bug can die from being mated by too many males. Size Bed bugs can range in size from 1/16 of an inch to 1/4 of an inch. They go through a series of stages in their life cycles, from egg to nymph and going through 5 moltings before they get adult size. The female bed bug is usually larger than the male. Appearance Since bed bugs go through different stages in their life, their appearance can vary quite a bit, especially in terms of size and color. The eggs look oval and white or off-white, nymphs are usually tan, and adults can look like a drop of blood with legs, if they have just fed, or flat, oval and mahogany colored if they have already digested their meal. A bed bug has 6 legs and a very small head attached to a prominent body. An adult bed bug looks like an apple seed with legs, with antennae which is half as long as its bodies. Habitat Both in clean and unclean surroundings, particularly in homes or bedrooms. They choose this habitat because they need fresh blood to survive and bedrooms enable them to obtain unlimited human blood as long as the human sleeps in that bedroom. Feeding Behavior Bed bugs feed solely on blood. Upon hatching into nymphs, they feed on blood and must feed before each molting until they reach adult stage in about a week. Once they reach adulthood, they can go for a year without feeding. How do they spread? Bed bugs can spread through close proximity areas, like in apartment buildings. They can crawl and infest any room or even travel in luggage or old furniture. People can easily get a bed bug infestation if bugs hitchhiked via luggage or crawled into their living area from a neighboring infested room, apartment or condominium. It is not uncommon to get receive bugs bites while staying at hotels or inns. They can hide in nooks and crevices of furniture, which makes it easy for them to spread and a nuisance to control. The majority of bug bites sustained by individuals at night are blamed on bed bugs but what are the signs and symptoms of bed bug bites? The first manifestation of bed bug bites is usually the tell-tale bed bug rash. Bed bug symptoms are what can be felt by the humans being bitten by this bug. Rashes which are very red and small but often have a darker spot in the center. Rashes which appear to be arranged in a cluster or a rough line, found on the hands, arms, neck and face. On some cases, in people who have an allergy to bedbug bites, hives, blisters or severe itching might be present. In the case of any possible allergic reaction, professional treatment by a physician is of utmost importance. Bed bug bites can also be mistaken for flea bites because they share many signs and symptoms. They may also mimic mosquito bites to those inexperienced in identifying them. These common mistakes are a result of not knowing how a bed bug bite feels. A question that comes up is do bed bug bites itch? Yes, they do; itchiness and rashes are the main symptoms of bed bug bites. If bed bug symptoms are present, it is important to look for signs of bed bugs to make the diagnosis certain and to know which step to take next. Signs of bed bugs are not always easy to see unless the infestation is severe, but some bed bug signs can be obvious if one knows what to look for. The best way to know whether you have a bed bug infestation is to look for bed bug signs. Dark specks which looks like coffee grounds. This is bed bug excrement which is typically found along the seams of the mattress. Empty exoskeletons which look like the dried remains of bed bugs. These are often colored light brown and are the discarded exoskeleton of bed bugs after they have molted. They do this for 5 times until they reach adulthood. Bloody smears which can be found on the sheets. These may be very small to very noticeable, and mark spots where a human may have crushed the fully engorged and have just-fed bed bug. Keep the area with bed bug bites clean at all times. Resist scratching the bed bug rash. Apply an anti-itch cream like a hydrocortisone cream or aloe vera gel to soothe irritation and minimize itchiness. Oral medication like the antihistamine Benadryl might be useful to help minimize the itchiness. Any other symptoms, like inflammation, fever, or any signs of an allergic reaction should be treated by a medical professional as soon as possible. In most cases, reaction to bed bug bites only manifest a few days after the bite has occurred Therefore, a person who suddenly develops a bed bug rash after travel may have unknowingly brought the bed bug with him or her from the area of travel. In such cases, it is important to know about prevention, treatment and control of bed bug infestation. Using cover up – Wearing clothes that cover the skin such as pajamas and socks are effective because bed bugs do not burrow under clothes. Using mosquito netting – Bed nets treated with permethrin may be effective against bed bugs but this method is not fully recommended because bed bugs may already have developed resistance to it. Avoiding purchasing second hand items as such items may be harboring bed bugs. Check mattresses and bedding when staying in hotels or any other place which is not your home. Staying in infested places means that the bed bug can transfer to your belongings and therefore infect the home as well. Freezing – Freezing works well for small items and bedding. The downside is that items need to be left inside the freezer for a few days for it to be effective. Vacuuming – Vacuuming works well on furniture to physically remove the adult bed bugs from hiding places which the eyes can see. Ensure that crevices are scraped or vacuumed as well. Hot Water – Hot water treatment with the use of the washing machine set at a temperature of at least 49 C or 120 F can kill bed bugs. Clothes Dryer – Setting the clothes dryer at a high temperature for a duration of 20 minutes will kill bed bug eggs and adults. Throwing away furniture – Large pieces of furniture like mattresses will need to be thrown away or be completely encased in bed bug proof casing. Bed bugs were thought to be thoroughly controlled in past decades, but with the increase in travel, bed bugs are making a comeback – and with this comes an increase in bed bug bites. Fortunately, a little bit of knowledge can go a long way in the prevention of bed bugs bites and infestation. It’s important to know the signs, symptoms and treatment of bed bug bites.